When we feel challenged by change, fears can creep in. Summer is a unique time to enjoy the out of doors, breath deeper and start something fresh and new! What about a change to self empowerment? In Go Power Point #8 Jerry says “Don’t buck the tide, swallow your pride and jump in the water, catch the wave and ride it toward your goals.” You don’t have to be a surfer dude to ride a wave. But it is necessary to have a goal to ride a wave toward it! Many of us go to the beach, float around, as we do in our life without a goal. Try something this summer: set a goal to get to know yourself better, become a better friend of yourself. That means self empowerment. Give yourself the pat on the back of encouragement. Enjoy the summer – take some of the power of the ocean and ride it to a goal – pick one. Then keep catching the wave, practicing over and over till you reach it! This will be a summer you will remember! PS Take the E Out of Ego & GO! 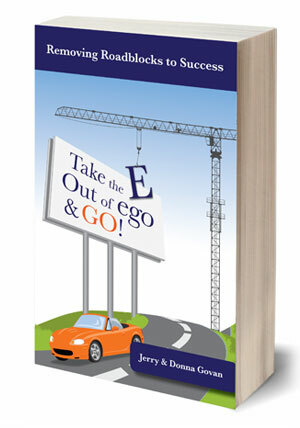 Makes a wonderful graduation gift – young adults will find it a fun read with lots of sports analogies, a couple army stories, and a Handbook of keys to a successful life without ego.